Which Samsung Gas Ranges Can Be Converted To Liquid Propane? All Samsung Gas Ranges can be converted to use Liquid Propane. 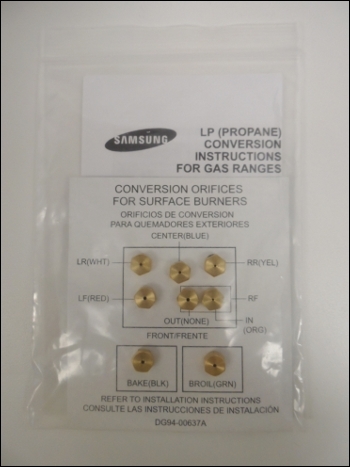 Additionally, all Samsung Gas Ranges come with the LP Conversion Kit shown below. It includes LP Orificies and instructions for installation/conversion. WARNING: This conversion must be performed by a qualified installer or gas supplier in accordance with the manufacturer's instructions and all codes and requirements of the authority having jurisdiction. Failure to follow ALL instructions could result in serious injury or property damage. The qualified agency performing this work assumes responsibility for the conversion.